God is proving Himself faithful and working beyond our expectations and today was no exception. Our day started off with the routine of breakfast and team devotions and then time in His Word. God woke me up early again today and it wasn’t too much later that I figured out why. I had an opportunity to connect with a friend down here who “randomly” showed up in the cabana where I was. It was such a God moment as I had the opportunity to listen and pray for this friend. We are all learning to hear the Spirit and follow His leading better each and every day. While the team headed off to work at Las Parcelas, Brinson and I headed into Managua to grab some supplies for our surprise “Extreme School Makeover”. Through our support raising as a team, we were able to purchase 2 whiteboards, 1 teacher desk and chair, paint for the playground, 2 new pieces of playground equipment and a few other supplies. God met us at each location by providing great deals on everything we purchased. Taking these kids to Campo has really opened up some amazing doors of ministry. 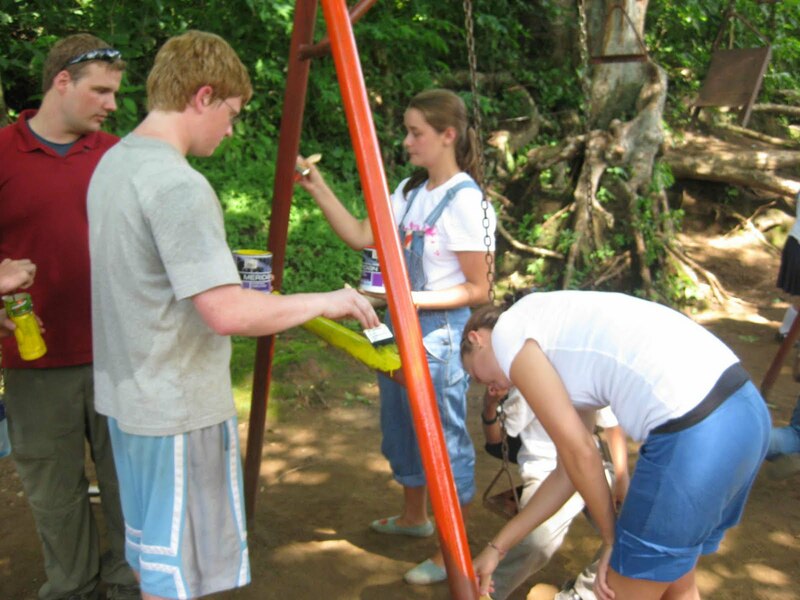 While we were shopping, the team was serving at the school by cleaning up the trash and landscaping Nica style. Parents of some of the campers brought corn and cheese as gifts to our team. Then they also surprised us by cooking a hot lunch for the team. This is a poor, rural farming community with generous and grateful hearts. We are praying about a strategic and long-term relationship with them and are excited about what the future could hold. You could definitely join us in praying for God’s will in this! After lunch, we played with the kids while painting their existing playground equipment. Nearly all of the kids we took to camp stuck around after school and the older kids that go to secondary school even came to hang with us. It was so much fun catching up with them and playing with them. We are all amazed at how quickly and deeply these relationships are forming. Tomorrow we will present all that we have purchased and begin the installation process. We are also hoping to purchase more paint to update the exterior of the school building. Our time is running short and we are trying to accomplish all that God would have us to, so please continue to pray!